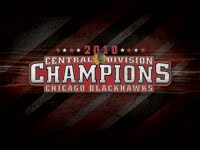 Congratulations to the Blackhawks on winning their first division title in 17 years!!!!!! The Red Wing monopoly has been busted!!! that's the first Hawk division win since the old Norris division... and the last team that won the division before Detroit was St Louis, coached by...... Joel Quennville. Nice to see the Hawks winning again after a tough stretch. Go Niemi! The Hawks won the Norris in the 92-93 season, then promptly got swept in the first round by the Blues. Hopefully history doesn't repeat itself.